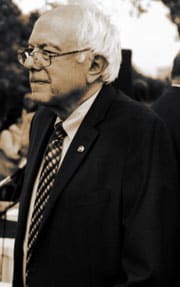 Vermont Senator Bernie Sanders released an Economic Agenda for America last week, detailing 12 reforms to help make this economy work for working people once more. His reforms strikingly highlight the great gulf between what most Americans believe and what the politicians they elect enact. Polls show a majority support for virtually all of Sanders’ reforms. In contrast, Republicans in control of Congress, almost in lockstep, oppose each one of them. And the Wall Street wing of the Democratic Party bridles at many. Sanders hasn’t yet decided whether he has the desire and the necessary activist support to make a run for the presidency. But one thing is clear: His agenda on the central issue of the day – the economy – already earns widespread approval. Congressional Republicans refuse even to allow the minimum wage hike a vote in the House. But Americans are clear. A Pew Research Center poll in January 2014 reported that nearly three-fourths of adults (73 percent) supported raising the minimum wage, including a majority of Republicans. This fall, minimum wage initiatives passed in red states like Alaska, Arkansas, Nebraska and South Dakota. Seattle and San Francisco have voted to lift their minimum wage to $15.00 an hour, and Chicago to $13.00, with many other cities beginning to move. Congressional Republicans mocked pay equity legislation as election year pandering. But a September Gallup poll reported that pay equity was the leading issue facing working women in today’s economy. A July poll by the Democracy Corps found that 90 percent of Americans favored measures to help women get equal pay for equal work, thereby raising wages for women and families. Republicans have blocked President Obama’s call for investing in pre-K, and filibustered Sen. Elizabeth Warren’s legislation to allow refinancing of student debt. A 2014 bipartisan poll for the First Five Years Fund found that 71 percent of voters, including 60 percent of Republicans, supported more investment in early childhood education from zero to five years old. A November 2014 NBC/Wall Street Journal poll reported that 82 percent of Americans support providing access to lower cost student loans and providing more time to those who are paying off their student loan debt. Despite lobbying by the Chamber of Commerce, Republicans have rejected Obama’s relatively modest measures to invest in rebuilding America. As an NBC/Wall Street Journal poll reveals, three-fourths of Americans support increased spending on infrastructure projects like roads and bridges. And a 2014 poll by the Benenson Strategy group reports that two-thirds believe the U.S. needs to increase investments in infrastructure and education rather than worrying about long-term debt. We must transform our energy system away from fossil fuels and into energy efficiency and sustainable energies. Transforming our energy system will not only protect the environment, it will create good paying jobs. Republicans, notoriously, are largely deniers of climate change, scorning green initiatives of any sort. Yet a June ABC/Washington Post poll reports that 70 percent of Americans believe that the federal government should require states to limit the amount of greenhouse gases produced within their borders. Benenson polling finds that 83 percent agree we need to invest more in the development of renewable energy sources like solar and wind. Republicans and many Democrats, including the co-chairs of the President’s ill-fated fiscal commission, have supported cutting Social Security. The Republican budget proposals have proposed deep cuts in Medicaid, food stamps and other nutrition programs. Yet, 79 percent of Americans believe that it is more important to reserve Social Security benefits than keep taxes low. A YouGov/Huffington Post poll found 61 percent favored food stamp funding kept the same (33 percent) or increased (28 percent). 55 percent support expanding Medicaid under Obamacare. Republicans oppose any initiative to raise taxes on the wealthy or the corporations. But Gallup finds that two-thirds of Americans believe that corporations are not paying their fair share of taxes, and 61 percent think upper-income individuals are also not paying their fair share. The measures above gain widespread approval among Democratic politicians and candidates, with dramatic differences when it comes to the concrete provisions. But Sanders goes on to propose a series of structural reforms critical to lifting wages across the board. Almost all are still popular with Americans, but many face opposition from Democrats as well as Republicans. In a Pew Research Center survey conducted in June 2013, about half (51 percent) of Americans said they had favorable opinions of labor unions, versus 42 percent who said they had unfavorable opinions about them. That was the highest favorability rating since 2007. In a separate 2012 survey, 64 percent of Americans agreed that unions were necessary to protect working people (though 57 percent also agreed that unions had “too much power”). In 2009, when card check was before the Congress, a Gallup Poll found that just over half of Americans, 53 percent, favored the new law that would make it easier for labor unions to organize workers; 39 percent opposed it. Democratic presidents, starting with Bill Clinton, have championed corporate trade accords despite widespread opposition in the Democratic Party. President Obama will seek to pass his Trans-Pacific Partnership largely with Republican votes. Americans want a different course. As PopulistMajority.org details, poll after poll shows broad majorities (over 60 percent) want to crack down on countries like China, oppose fast track for the TPP deal, and prefer offering countries a tax break for jobs they create here at home. An August Wall Street Journal/NBC News poll found that 79 percent of Americans still view Wall Street unfavorably. Rasmussen Associates found that half of Americans favor breaking up the nation’s largest banks. Support for cooperatives and worker-owned enterprises is only emerging as a national issue. But public attitudes have always favored such initiatives. While most Americans favor a national health care system, support for single payer or Medicare for all remains unformed. A Rasmussen Reports poll in April 2014 found that only 37 percent of Americans favored single-payer. And although the proposal has largely been out of the public debate since before Obamacare became law, earlier polling also didn’t find clear support. America will end up with something like Medicare for All, but clearly only after exhausting every other alternative. Americans, of course, are notoriously skeptical about “big government” and government spending, largely because they assume, not without reason, that government serves the rich and various entrenched special interests. By being willing to take on Big Oil (with green energy), global corporations (with tax and trade reform) and Wall Street (by breaking up the big banks), Sanders shows clearly what side he is on. He does what Sen. Chuck Schumer argued is necessary: demonstrates a populist temper that can overcome the doubts of a cynical electorate. We don’t know whether Sanders will choose to run. But we do know that his agenda will have broad appeal – and will draw clear lines with rival candidates. If Hillary Clinton enters the race, Sanders would surely offer a choice and not an echo.